These stories are, in large part, borne of miscommunication, misunderstanding, or somewhere in between. The truth is that 1) 93% of Scott's DNA did not return to normal, and 7% of his genes have not been permanently changed, 2) if you want to claim that the Kelly brothers are no longer identical, then they never actually were. So what happened here? First, the study design. This study looked at a lot of things- immune response, cognitive skills, the selection of tiny organisms living in the gut, and genome sequence at several different time points: before Scott went into space, while he was in space, when he got back, and then a follow up several months later. 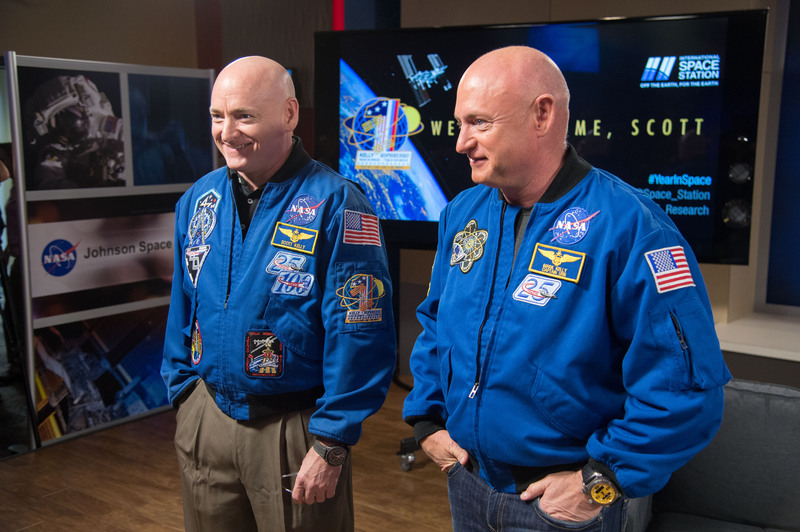 We would expect to see some changes in Scott, just because things are going to change over the two years the study was conducted regardless of a trip to space, but we can compare his changes to Mark's changes to see if they're substantially different. Cells need to make copies of their DNA every time they replicate, and it's actually a really complicated process. We like to think of our bodies like with think of computers, and thus copying the instructions should be like copy over exact copies of files, but the reality is, we are SO not like computers. To copy double-stranded DNA, the strands first need to be separated from each other. This is where you get the world's best pick up line: "I wish I were DNA helicase, so I could unzip your jeans". DNA helicase is the substance that separates those two strands. Other substances, called DNA polymerases, locate "start" signals in the DNA code, latch on, and start adding new blocks, with the separated strand of DNA serving as a template for what to add. You end up with two copies of the DNA, with half of each copy being from the original strand. This process is actually incredibly accurate. There's only a mistake about 1 out of every 1,000,000,000 building blocks added.4 The problem is that we add a lot of building blocks. There are 3,000,000,000 building blocks in the human genome,5 you build two strands at a time, which leaves room for 6 mutations every time a cell replicates. Factor in that a cell divides 50-70 times over the course of its life,6 and multiply that by the fact that there are 37 trillion cells in the human body,7 and, well, that's a lot of mutations, that happen every day here on Earth just because of whoopsies. So a few things here. First, if Scott Kelly really DID have 100% of his DNA change, as the 93%-7% figure seems to suggest, he would be dead. It's unclear if the original release meant to indicate that 93% of the changes observed when he first returned to Earth reverted to their original state, or if 93% of his DNA is normal, or what was exactly the details are. Second of all, we have to look here at whether these mutations occurred at a higher rate than they did in Mark. It appears that they did, but the important thing here is that you can't make that determination just by comparing Scott's DNA to Mark's; you have to compare Scott's before and after, and compare the proportion of changes to Mark's before and after. Third, because these types of mutations happen basically constantly, if the point is that they've caused Scott and Mark to no longer have identical DNA, well, the boys are 54 years old. That's enough time for a lot of mutations, and it is a 100% guarantee that they had separate mutations before Scott left for space, so using that argument, they were NEVER identical twins. Let's back away from DNA for a second and talk about genes. DNA is organized into chromosomes. Twenty-three groupings of DNA (provided that you're human) that contain smaller divisions called genes. These genes are what code for everything about us, from the things that make us unique, like our hair color, to the things that make us exactly like every other living organism, like that cells have a lipid bilayer membrane surrounding them. Only about 1.2% of our DNA is part of a gene; we're still figuring out what the rest of it does.8 This means that the odds of any single DNA mutation that happened to Scott when he was in space being in a part of the DNA that actually codes for a gene are really, really small. If we go back to the rate of mutations, it's a pretty safe bet that some of them are, but mutations in your DNA do not mean that you're a genetically different person,9 because most of them happen in places that don't actually affect anything. Just from the fact that there are changes in the DNA code means nothing about what's actually being expressed. Which brings me to the next point- gene expression. The way that genes are expressed is by copying DNA into the very similar but single stranded RNA. Molecules then run along this single strand of RNA, following its instructions to build proteins, pretty exactly like how my boyfriend will carefully track a recipe with his finger to make sure he doesn't miss anything. These proteins are what makes everything happen in our bodies. There are lots of things that can happen that can cause this process to change. Stress in our lives, exposure to drugs or toxins, the weather, so many things can either add molecules to DNA or change how it folds up, which change how things are expressed. Genes can be turned on or off, told to create more of one type of protein and less of another. Different gene expression is why cells in our bodies do different things, even if they all have the same DNA. This is what happened to Scott Kelly. The 7% of genes number that's being cited was not changes to his DNA, they were changes in how his DNA is expressed. The DNA is still the same (minus mutations), and he isn't genetically different to himself or his brother. The genes that have continued to express differences include genes that play a role in the immune system, DNA repair, and bone formation. Note that they don't CAUSE these things, because they're all super complicated processes, but they're some of a number of genes that play a role in these processes. Again, if you want to use these differences in expression to claim Scott and Mark are no longer identical, then they never were. There were some changes to the DNA itself in a way. First, loose bits of DNA were found freely floating in his blood stream, likely due to stress. This could be the mental stress that we usually think of when we use that word, but it also probably related to the physical stress of living in a small space with artificial conditions, changes in gravity, and other stuff that our bodies are just not used to. It turns out that much like humans, DNA likes to go for a float in a river when it's feeling stressed. The other difference that they noticed (which quickly reverted back to expected) is in the length of his telomeres. Telomeres are portions of DNA on the endcaps of the strand that control how many times a piece of DNA can be copied. As you age, they get shorter, limiting the number of times DNA can reproduce. The scientist's interpretation of this is that it was likely due to the amount he was exercising or the ISS diet of prepackaged foods that somewhat calorie restricted. Basically, this effect was due to diet or exercise, which says that it really did have much to do with being in space, just living healthier. The study on Scott and Mark has some really cool findings, and we should definitely be publishing them and talking about them. I say that with a few caveats: first, we should maybe put a hold on these conversations and stories until the actual papers from the scientists come out. Right now, all we have are two pretty ambiguous NASA press releases that people are running with. Second, the outlets writing about this story should probably check that the people they have writing them understand DNA replication, transcription, and translation, or at the very least should be basing their stories on their own reading of the releases, and not just borrowing the same phrases and explanations from people who already bungled it. Third, this world (and apparently other ones) are cool enough places that we don't need to make science news more dramatic; it's already amazing and fascinating and mind blowing. Let this astonishing world speak for itself; there's no reason to put (not so true) words in its mouth. Sorry for being a such a grumpy bugger today. I'll return to a few more "our brains are crazy" posts tomorrow. If you don't want to miss out on those, follow me on Facebook, or follow me on Twitter to talk about how wrong these stories are. The brain is amazing. It is intensely complex, relies on a complicated scaffold of processes, involves constant communications over trillions of synapses, and it has to be both incredibly specialized and also able to handle all the new things we constantly throw at it. A healthy, functioning human brain is fascinating, but as humans, we like the weird stuff. Knowing how things work can be interesting, but knowing how things can break is more fun. For today's Brain Awareness Week post, I'm doing a rundown of the wacky-- the types of delusions that you mostly only see on TV. Capgras Delusion- People with Capgras syndrome believe that someone close to them or important to them-- friend, spouse, parent, child, pet-- has been replaced with an identical imposter. Usually they only believe that one person is an imposter, not everyone around them, and it can be incredibly frustrating that no one else sees what you see. These patients don't necessarily know who the imposter is or why their loved one has been replaced, only that they have. Capgras is thought to be related to deficits in communication between areas of the brain, such as areas that specialize in recognizing faces and areas that process emotion or areas important for remembering specific events. Cotard Delusion- In Cotard delusion, patients believe that they are dead, don't exist, don't have internal organs, or are rotting away. The most common manifestation is the denial of a person's own existance. Like Capgras delusion, it's thought to be related to disconnection between face recognition centers and structures known for their role in emotion processing. This disconnection is often due to brain degeneration, injury, or lesion. Fregoli Delusion- In keeping with the dysfunctional face processing trend, Fregoli delusion is the belief that a single person is using disguises to appear as multiple different people in the patient's life, usually due to some sort of persecutory reason. Syndrome of Subjective Doubles- Syndrome of subjective doubles is the belief that the person has a Doppelgänger out in the world, living their own life. Usually, the Doppelgänger has a separate personality and life history than the patient does, but sometimes it is also a mental clone. The Doppelgänger may be a different age, or the patient may believe that THEY are actually the Doppelgänger. Syndrome of subjective doubles is a delusion that is often present in schizophrenia and bipolar disorder. Somatoparaphrenia- This mouthful describes the belief that an appendage or even one side of the body does not belong to the patient. They might believe that the limb is not attached to their body, or they be convinced someone else limb has been attached to them. Sometimes this is found in cases of hemineglect, and sometimes the patient will experience paralysis in that appendage. It is believed to be due to brain injury, degeneration, or lesion. Clinical Lycanthropy- If you watch Supernatural, you'll already guess what this delusion is. Clinical lycanthropy is the belief that the person can transform into an animal. Like a werewolf, though it doesn't have to be a wolf. The patient either recalls feeling like an animal, or will engage in animal-like behavior: moving like the animal or making similar sounds. Clinical lycanthropy is a specific manifestation of other psychotic disorders like schizophrenia or bipolar disorder. Folie a deux- French for "madness of two" (Note: you can also have folies of other numbers, or even groups). This is a shared delusion. It occurs either when one dominant person develops a delusion and is able to influence a secondary person to have the same delusion. The second person in this situation most likely would never have developed a delusion on their own, and their delusion will resolve on its own if the two are separated. The other form of folie a deux occurs when two people develop delusions independently that feed off of each other and fuel each other, merging into a single, shared delusion. This could be, for example, two people prone to paranoia and persecutory thoughts. One person notices something sketchy that confirms the other's suspicions, and now the first person has more evidence for their belief, and it snowballs from there. These are all pretty freaking rare disorders and syndromes, much rarer than soap operas and crime procedurals would have you believe. They are all real, but they're often exploited for the sake of story line-- having someone with Capgras kill the person they think is an imposter, or someone with somatoparaphrenia cut off the offending limb with a table saw. The brain is amazing, but it does some really weird things. Signing off til tomorrow, when I'll have a new crazy brain phenomenon to blow your .... mind (see what I did there? Get it? Because, like, mind-brain?) In the meantime, Twitter here, Facebook here. Follow, share, retweet. Even though it's day two of Brain Awareness Week and everyone should be SUPER EXICTED, it is also the worst day of the year- the Monday after Daylight Savings Time starts. Because I care about you, I'm going to keep today's post short so that you can get to bed and catch up on the sleep you missed out on this morning. Here's my favorite brain fact to tell people: why we get the spins while drinking. The vestibular system is dedicated to your sense of balance and orientation in space. The structures of the vestibular system are located in the inner ear, with sensing neurons sending messages to various parts of the brain and spinal cord to coordinate body movement and maintaining balance. One of these structures is the semicircular canal, which is a pretty apt name for a half-circle shaped tube filled with fluid, specializing in detecting angular momentum-- spinning. The semicircular canals have a membrane on each end, and if the head rotates, the fluid in the canal, endolymph, gets pushed up against the that membrane. Think about if you were to put water in a Hula hoop, hold it horizontally, and then rotate the Hula hoop left and right. The water would pretty much stay still while the hoop moved around it; that's pretty much what's happening in your ear. Which membrane has the fluid press against it tells the brain which direction your head is turning. Alcohol is a blood thinner (which is one reason why reputable tattoo and piercing parlors won't let you partake in their services if you have recently imbibed), but it also thins other bodily fluids, like, for example, endolymph. When you drink, the endolymph in that canal gets thinner and sloshes around more, even if you're not turning your head, right up against those membranes that tell your brain there's been angular moment. Your brain interprets that as "Weeee! I'm spinning!" and the spins are born. We can take this one step further though, because why the spins are worse when you close your eyes is also all about the brain. When your eyes are open, you're also sending your brain visual messages that conflict with what your vestibular system is saying. Your ears say you're spinning, but your eyes say you're not. Your brain has to bring these two together, usually mostly trusts your eyes, and stands down a bit on the spinning interpretation. If you close your eyes, you no longer have any visual input to override what your semicircular canals are telling your brain, and off you go again into the land of swirly twirly gumdrops. Don't test this right now, because you shouldn't be drinking on a school night. Instead, migrate over to Twitter and Facebook and follow me so other people start to learn how cool I am. Today is the start of Brain Awareness Week, and I am super stoked. In honor of this holiest of holy weeks (from my perspective, anyway), I've decided to do a series of posts on my favorite brain phenomena- the stuff I've learned about over the years that makes me go "Whoa, that's so freaking cool". First up- hemi-neglect. To understand what's happening in hemi-neglect, you need to understand a little bit about how the visual system works (also, as a visual neuroscientist, I just want to talk a little bit about how the visual system works). Light reflected off of objects hits our retinas at the back of our eyes, and cells there turn the photons from the light into electrical signals. These signals are passed from the retina to a structure called the lateral geniculate nucleus along the optic nerve. The LGN is basically like a relay station, and sends the signal to the primary visual cortex, which specializes in gathering information about basic features of the image- where it is, orientation, how bright it is. That information gets passed to other areas of the visual system that specialize in detecting edges, processing color or motion, and recognizing objects and faces. It's not a perfect hierarchy, though, and some signals skip earlier areas and go straight to later ones, and sometimes the later areas send signals back to earlier ones. Other, non-visual parts of the brain also get involved, like areas that control attention or voluntary movements. One thing that's important in hemi-neglect is that right side of the brain processes the left visual field and vice versa. This doesn't mean it only processes information from the left eye, rather information from the left side of both eyes, which makes up what we see that's on the left side of our nose. "Blindness" in the traditional sense is often caused by damage to eye or the optic nerve which keeps signals from even getting to your brain. If there's damage to the cortex caused by a stroke or disconnecting one hemisphere of the brain, however, those messages that get sent that skip around the damaged areas and go straight to other parts of the network. This can lead to your brain knowing there are objects in your visual field, but you not being consciously aware of them. Essentially your brain knows something you don't. Hemineglect has different forms, determined by what the reference point of the neglect is and the range of the neglect. In some cases, the person is their own reference point, and they're not aware of anything that happens in the left half of the world as they're looking at it. They're not aware of people sitting next to them on that side, have a tendency to walk into walls and doorways on one side of their body, and if you moved a pencil in front of them at the optometrist, it would disappear as soon as it crossed in front of their nose. In some cases, every object is it's own reference point. People suffering from this type of neglect will not be consciously aware of half of every object in front of them. Put a dinner plate in front of them, and they'll only eat food on one side of it. In some really crazy cases, people will neglect one side of an object even though it's on the right side- ignoring Asia on a flipped map, for example, because they know that it's supposed to be on the left. It's not just about seeing, though; often people will demonstrate the same type of inattention in drawing a clock, only including numbers 12-6. If you ask a patient with hemineglect to imagine they're standing at a certain location in a place they've been and describe what they see, they'll leave out all the things on one side. If you ask them to imagine they're standing directly opposite of the first location, they'll describe all the things they didn't include the first time, and not be aware of anything they did already include. Sometimes this will apply to all objects in view, sometimes only to objects within arm's reach, objects that they're capable of interacting with. I said that hemineglect is your brain knowing something you don't, because even though the patient isn't consciously aware of something in that location, they might still respond or interact with it, and have no idea why. They might step out of the way of an object while walking, even though they don't know why they did that. If you write something like "animal" on a paper in the neglected hemisphere and then ask the person to name some words that start with the letter "B", they'll be more likely to name animals, even though they don't know that there's even a word there. In the end, it's not really a question of being able to see, because the brain is seeing stuff, but a question of being consciously aware of things, which makes it an interesting question for people interested in consciousness. Hemineglect is most often caused by strokes that damage tissue in the parietal cortex. For a long time, the theory was that it was due not all of the tissue being damaged and signals jumping between tiny islands of healthy tissue left in the visual cortex. However, you can see the same types of deficits in patients that have had entire hemispheres of their brain removed, so there's definitely no healthy tissue islands left. There's really not a single mechanism that can account for all the different forms of hemineglect, so in reality, it's probably a cluster of different things that we've grouped together because they all involve being unaware of one side of something, but either way, it tells us some really amazing things about how our brains work. Keep up with the rest of my Brain Awareness Week posts to learn about more fun brain phenomena! Follow me on Twitter for more science stories and conversations and Facebook to keep up with all my posts.